Purchasing a new-build property doesn’t always mean that you won’t want to make your own adjustments and improvements to it. While early in the build stage buyers can often tweak designs and change aspects such as kitchen layout or light switch and plug positions, living in a property can be the best way to see where improvements might be made. 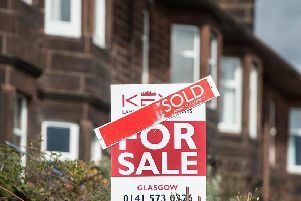 That was the case for Stefan Hampton who bought a five-bedroomed home in Dalkeith, Midlothian, off-plan five years ago. Stefan and husband David run a hairdressing business, Hamptons, with a branch in Morningside and one in Dalkeith, so they were looking for a location convenient for work. However, it was the generous garden space that really attracted them to their home at 43 Elginhaugh Gardens. David also works as an auditor for the SQA, so having a train station within walking distance means he can commute round the country – sometimes to colleges in locations as far afield as Thurso – quite easily. The detached CALA home, which is one of just 49 on the site, wasn’t complete when they bought it, so a degree of imagination was needed. But Stefan says its position appealed hugely: “At the back there is a gap of about 30 metres filled with mature trees before you get to the next set of houses, so for a modern house on an estate there is a really good degree of privacy. Inside the house is equally spacious with all the downstairs living space oriented towards the south-facing garden, so it is lit by the sun all day. A dining kitchen with French doors onto a patio adjoins a separate dining room which is open plan to the main sitting room, again with doors to the outside. The impressive central staircase was one of the features that Stefan and David are responsible for. They replaced a more traditional spindled stair with a chic glass affair, opening up the centre of the house and creating an open walkway for a landing, which has proved a great place to display the couple’s art. The have also replaced the kitchen, adding silestone worktops and convenient touches such as the boiling water tap and electric garage doors have been installed. The standard floors throughout the house have also been replaced by beautiful Amtico flooring. “It was mainly mud,” says Stefan. But with the help of a professional landscaper, they have transformed it into a lovely, relaxing space, which is very low maintenance for its size. Stefan and David have left some improvements up to the choice of the next owner, although they have secured planning permission for three extra windows, to further take advantage of the house’s sunny positioning. One is directly opposite the breakfast bar in the kitchen, another is planned to bathe the open stair with light and there is permission to add to the windows in the master bedroom. No 43 Elginhaugh Gardens is a lovely, low-maintenance home in a convenient position for commuters. In David and Stefan’s time there they have added some excellent improvements that certainly don’t come as standard in a new build.